Julian St. David, Duke of Haverford, is barely keeping his head above water in a sea of inherited debts. Though he has a long-term plan to restore the family finances, his sister has a much faster solution: host a house party for London's single young ladies and find Julian a wealthy bride. Elizabeth Windham has no interest in marriage, but a recent scandal has forced her hand. As much as she'd rather be reading Shakespeare than husband-hunting, she has to admit she's impressed by Julian's protective instincts, broad shoulders, and, of course, his vast library. As the two spend more time together, their attraction is overwhelming, unexpected... and absolutely impossible. With meddling siblings, the threat of financial ruin, and gossips lurking behind every potted palm, will they find true love or true disaster? Grace Burrowes grew up in central Pennsylvania and is the sixth out of seven children. She discovered romance novels when in junior high (back when there was such a thing), and has been reading them voraciously ever since. Grace has a bachelor's degree in political science, a bachelor of music in music history, (both from Pennsylvania State University); a master's degree in conflict transformation from Eastern Mennonite University; and a juris doctor from the National Law Center at the George Washington University. 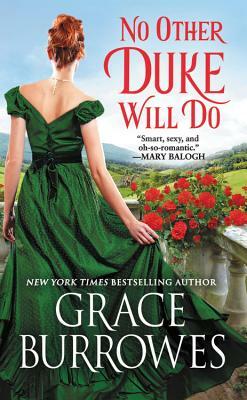 Grace writes Georgian, Regency, Scottish Victorian, and contemporary romances in both novella and novel lengths. She's a member of Romance Writers of America, and enjoys giving workshops and speaking at writers' conferences. She also loves to hear from her readers, and can be reached through her website, graceburrowes.com. Burrowes' fans, as the extended Windham family is as nosy, matchmaking, and protective as always. throughout this affecting and clever tale."